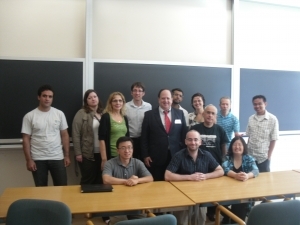 On the week of August 20-24th Cerebral Diagnostics Inc. proposed a question to the many brilliant mathematicians who have come from all over the world attending The Fields Institute Workshop. The power point presentation discussing the problem can be seen below as well as an overview of the problem. “I will describe the problem first in non-mathematical terms to clarify what we are trying to achieve and why. Then I will attempt to provide a mathematical frame work. We want to be able to isolate current density signal patterns extracted from (electroencephalography) EEG and to measure small transient (often less than one quarter of one second) mental events in the brain such as little cognitions like what you mind does when you imagine the shape of a letter in the alphabet in your mind. If successful there are numerous ramifications for this for neuroscience. For example, it could help people communicate. I, and many others, believe that these signals are hidden amongst the many EEG signals taken while a person performs the cognition. EEG itself plots voltage against time and, on its own, it is far too crude to find the type signals we are looking for. I believe this is because they are weak signals of low voltage that are coming from tiny areas of the brain and they are overshadowed (buried) among various larger signals.) For example it is known that there are special areas of the brain in which language aspects of vision and lettersare likely imagined. We do source localization using an existing algorithm called eLoreta. This gives us a data set at each instant in time providing4 numbers for each voxel for each instant in time. The numbers are the x, y and z components and magnitude of the current density for each voxel. The voxels are in known positions. When we make brain movies of these vectors we often see them dancing together. We use our imaging software to draw the vectors as lines radiating from the centre of each voxel. 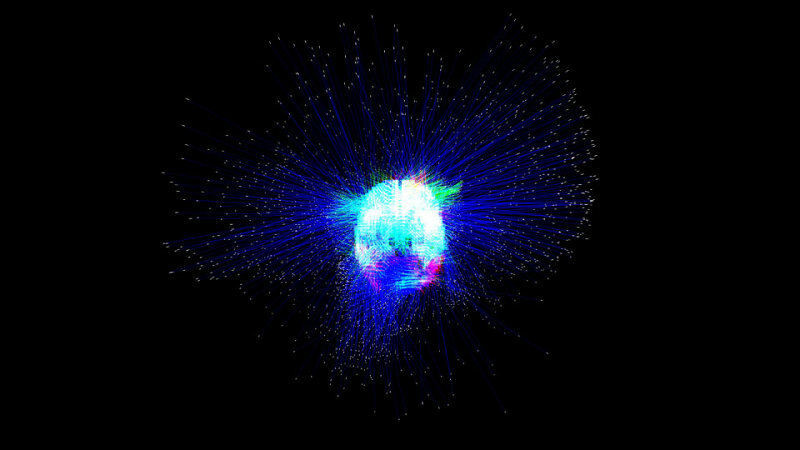 We can clearly see clusters of voxels. 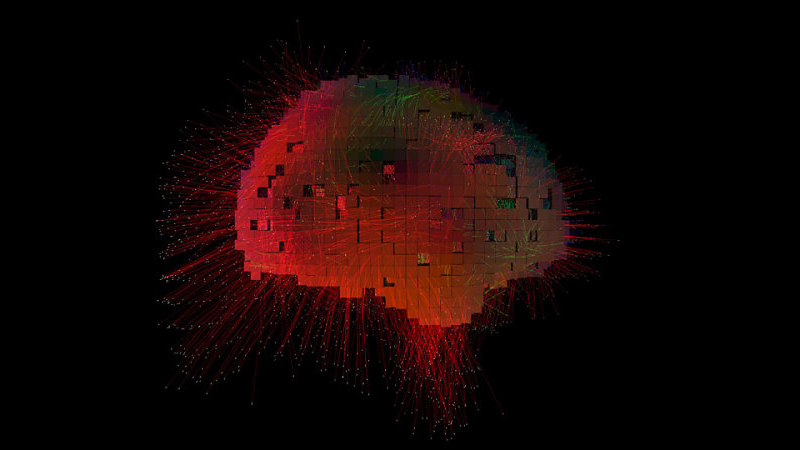 For example, voxels 2 and 3 are side by side at the bottom of the brain. 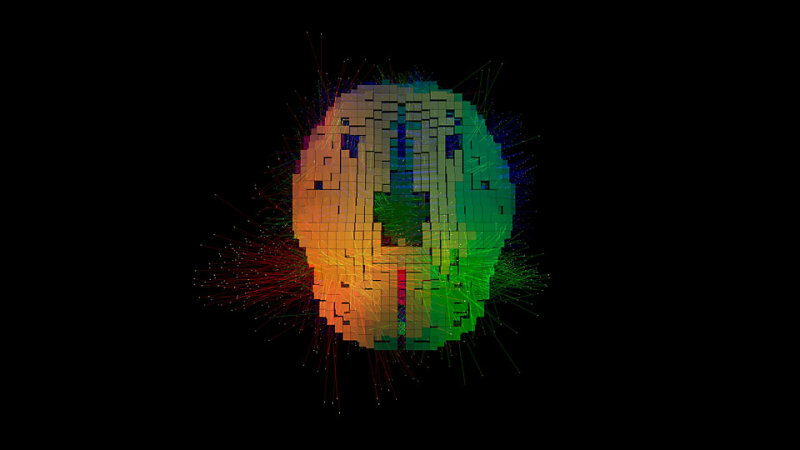 In a given EEG recording they may be seen pivoting in unison about the midpoints of the voxels. At a given time instant within a given frequency band (e.g. 2-4 Hz brain activity) they may be seen pivoting about their center points in near perfect synchronicity the same movement pattern. (This is a little hard to explain but easy to see in the movies.) Hence as the vector radiating out of one voxel shifts in the direction it is pointing, we might see the vector radiating out of the adjacent voxel shifting in almost exactly the same way. 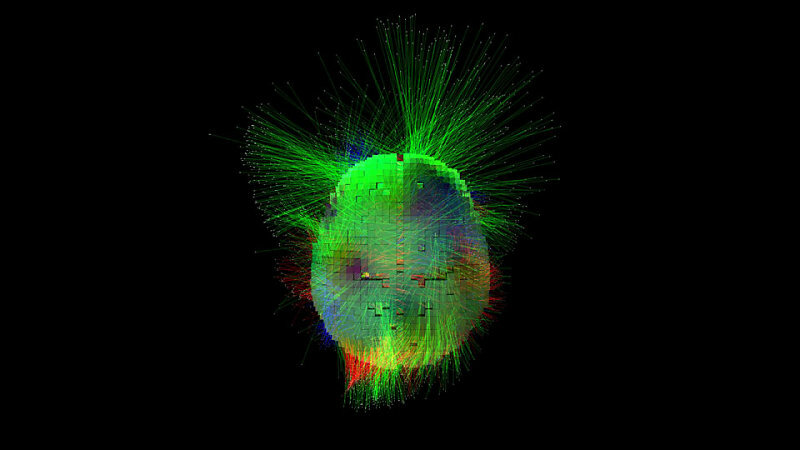 What we need in the long run is a real time tool to colour code clusters and to make a list of the voxels that are members of a cluster at an instant in time. For example if there are 10 voxels in one cluster that are pivoting in one pattern then we need a colour assigned to all the vectors in group. In the short run, before tackling the issue of real time, we need a post-processing method. Eventually we want this to be implemented in C++ because we want to make it part of our brain movie software bundle called DECI which is written in C++ and open GL. Deci (Dynamic Electrical Cortical Imaging) is our software bundle. It can be made available through a free software research license. Data sets and sample movies are available to team members. This can be used to validate any new tool created by the team. If your tool works it will pick out the clusters of vectors we can see with our own eyes dancing together in the movies played with DECI. The list below lists the people who helped us in solving our cluster analysis problem of current density vectors. The names are ordered based on the picture above starting from the left most person on the top row to the bottom.